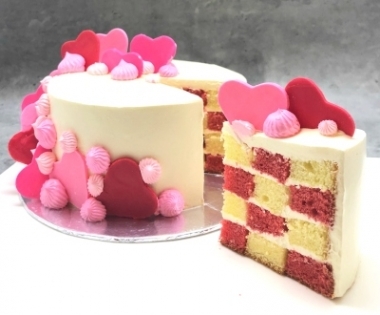 Impress with a Buttercream Checkerboard Cake this Valentine's Day. This unassuming cake has a magical secret! Layers of luscious buttercream over alternate cubes of vanilla & strawberry cake, embellished with lots of chocolate hearts. Limited time only, comes in 0.5kg 6" diameter size. Collection by 28 February 2019.